This confirms what I originally reported when it happened. 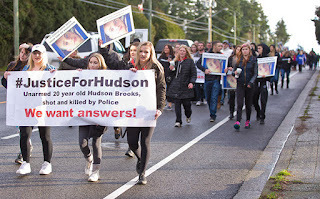 Hudson was running to the police for help. He wasn't saying kill me he was saying Help! They are trying to kill me! He was running from a mob at the same park where a mob beat Dario Bartoli to death. The female officer admitted on the radio she shot herself. 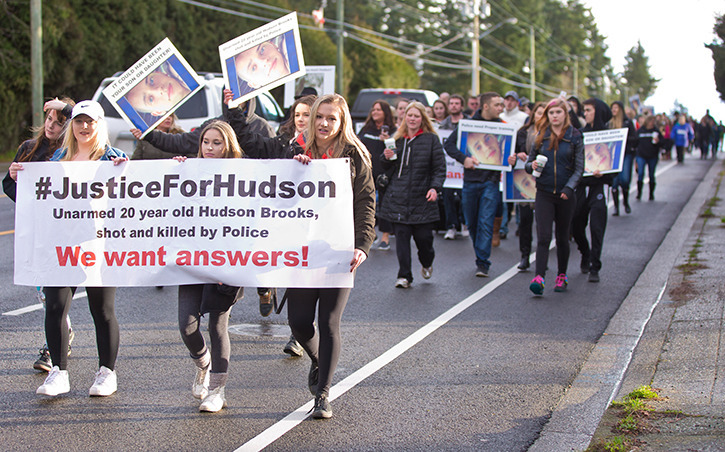 Hudson was unarmed running to the police for help. A female officer drew her gun and shot herself by accident and everyone else just heard shots fired officer down and shot Hudson dead. It was a heart wrenching tragedy. There will be no answers it will be swept under the rug like most police murders. Just like remo Romano the cop that was driving a regular pick up no lights or sirens at more then double the speed limit and he ran down an 18 yr old girl. He had narcotics in the truck but was never given drug test what a fn joke. Then to top it off he says it was girls fault for jaywalking. The piece of garbage works out of York detachment in Ontario. LMAO, shooting yourself while drawing your gun....right now the staff at Depot should be reviewing their records to see if she was problematic when it came to firearms issues when she was in training. Not that the RCMP are known for that kind of introspection or anything. The shooter also should have failed "use of deadly force" training. There is NFW she did not violate Rule #2 "Finger off the trigger until the target is in the sights and you are ready to shoot". What a clown show. Unfortunately it cost the life of someone they were supposed to be protecting. The kid had no weapon, deadly force was not authorized, and the officer who fired the fatal shots should be up on charges of criminally negligent manslaughter, and never again allowed to work as a police officer. but some one needs to admit this is what happened and an investigation needs to be launced and some charges need to be laid. No one gets to shoot some one even accidentally and getting a pass. It needs to be acknowledged, even if the findings are it was accidental. It can't be swept under the rug. Next time it might not be accidental. You mean like Ian Bush, the kid who was shot execution style by Constable Paul Koester in the Houston, B.C. RCMP Detachment, and the camera's conveniently were not working? Koester testified that he was being choked from behind by Bush, but being a master of bodily contortion managed to shoot Bush in the back of the head. The Edmonton Police Service blood spatter expert, whose work was well respected until this case, found that the evidence did not support Koester's statements. That kind of "not accidental"? Lets be clear here, this was not an accidental shooting. An accident with a firearm is where you did not intend what happened to happen. It is almost always also negligent by definition, because guns don't just go off by themselves. 99.999% of the time, there was a finger on the trigger when there should not have been. The officer(s) who shot this kid intended to do so. It was not an accident. Using the word accident is an attempt to mitigate guilt/blame for negligent homicide. Tragedy? That poor boy was murdered.